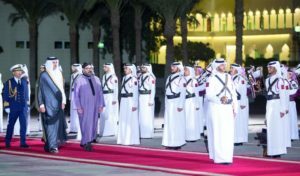 King Mohammed VI of Morocco and Qatar’s ruler Sheikh Tamim bin Hamad Al Thani held private talks Sunday in Doha, shortly after the arrival of the Moroccan king in the Qatari capital on an official visit. The two leaders discussed “regional and international topics of shared interest,” reported the Moroccan news agency MAP, without disclosing whether the Gulf crisis opposing Qatar to its neighbors was among these topics. Nonetheless, many commentators said the royal visit bears a mediation potential to defuse the Gulf crisis, given Morocco’s close strategic partnership with the GCC countries and its neutrality in the rift. This is all the more so, as the King was, before coming to Qatar, on a friendship and work visit to the United Arab Emirates, where he held talks with senior officials including Crown Prince of Abu Dhabi Sheikh Mohammed Bin Zayed Al Nahyane. The UAE is part of the bloc that severed ties with Qatar and cut sea, ground and air links with the tiny Emirate that they accuse of supporting terrorism and tightening ties with Iran. The boycotting bloc also includes Saudi Arabia, Bahrain and Egypt. The Moroccan-Qatari summit talks also discussed ways to promote the 45-year old ties between the two countries at the time the tiny Gulf country seeks to upstage its isolation in the region. According to the Qatari news agency QNA, Sheikh Tamim congratulated his guest for Morocco’s qualification for the Russian 2018 world cup, following the Moroccan team’s outstanding win in Côte d’Ivoire Saturday. The two leaders voiced their shared willingness to strengthen the fraternal ties and close cooperation between the two countries. Qatar is eager to rely on Morocco to further expand its export market and use the North African country as a bridge to Europe. Doha is mulling plans to establish marine links with North Africa from its mega Hamad port. Diplomatic ties between the two countries date back to 1972. 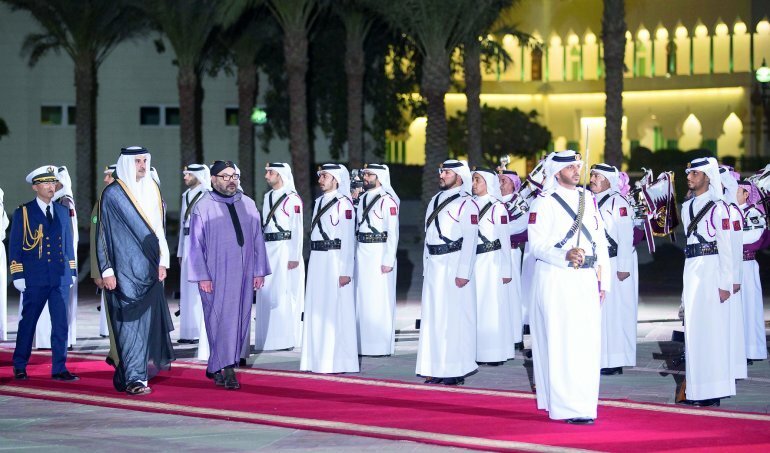 King Mohamed VI first visited Qatar in 2002. He made subsequent visits in 2012 and 2016. Posted by Khalid Al Mouahidi on November 13, 2017. Filed under News. You can follow any responses to this entry through the RSS 2.0. You can skip to the end and leave a response. Pinging is currently not allowed.